We have to give Bill Gross some credit for admitting his mistaken call on the U.S. Treasury market; see here. Gross's call was based largely on the fact that the Fed's Treasury purchase program was about to expire. The idea is that with a large component of the demand for Treasury debt removed from the market, bond prices should fall once the program is terminated. This is what you get when you apply the static Marshallian scissors toward understanding an economic phenomenon. It often works well. But not always. And in any case, we know that forecasting the path of security prices is a tricky business. This is what the efficient markets hypothesis tells us. Gross's intuition was shared by a few of the macroeconomists I bumped into earlier this year at a macro conference in Konstanz. I remember one of my Fed colleagues and myself suggesting to a sceptical audience that one should not expect any dramatic bond price movement once the Fed's purchases ended, largely because the market had already discounted that event. I don't think we were very successful at persuading people. Well, we turned out to be right about that (maybe we got lucky). [Actually, I did give my view of Gross' predictions here in March 2011]. Subsequently, of course, the price of US Treasuries have risen substantially. We did not make that prediction (nor did we try). But evidently, Paul Krugman seems to think he did; see Who You Gonna Bet On? Krugman's article gives the impression that simple IS-LM analysis could have predicted the recent fall in Treasury yields. Do people actually find this credible? A classic question in the theory of money is how an intrinsically useless object like fiat money can possess exchange value. The modern theory of money has essentially settled on the answer first provided by Ostroy (1973). In a nutshell, circumstances may dictate that some objects are relative good for record-keeping purposes, quite apart from any other use they may have in consumption, production, or storage; see also, Kocherlakota (1998). The basic idea is as follows. We know that monetary exchange is not necessary, even in economies where mutually beneficial bilateral barter exchanges do not exist (what economists clumsily call a lack of double coincidence of wants). This is not simply a theoretical statement; we know of (and indeed most of us belong to) small economies (networks of families and friends) that operate according to "gift giving" principles. We are willing to make individual sacrifices without monetary compensation, hoping that they will be noticed, remembered, and most importantly, reciprocated at some point in the future. Gift-giving societies seem to work well enough in small groups. This is probably because it is relatively easy to keep track of (remember) individual contributions and rewards in small groups. This "societal memory" seems to break down in large groups. Evidently, there are limitations to how much information can be recorded securely in the collective minds of people who make up society. When this is the case, some substitute form of memory could be useful. This is where money comes in. Imagine that there is an object that is durable, divisible, portable, hard to counterfeit, and in limited supply. A lot of commodities fit this description, including gold, silver, and salt (think of what "salary" means). Historically, privately-issued paper in the form of asset-backed securities (like the banknotes of antebellum America) have also fit this description. In larger economies, objects like these begin to circulate as a means of payment. They become money. Let me explain the basic idea. In the past, I may have made a contribution to society for "free." Well, not exactly for free; but because I knew that my contribution would be noticed and reciprocated. But as my community grows, it becomes increasingly difficult for people to keep track of each other's contributions. Well, if that's the case, then it might make sense to record my gift in some other manner. Accepting a monetary object is one way to do this. The money in my possession constitutes information about my past contributions to society. In the language of Narayana Kocherlakota (currently president of the Minneapolis Fed), money is memory. According to this view, the market value of fiat money consists exclusively of a liquidity premium. The asset has no intrinsic value, and yet it has a positive price. Fiat money is a "bubble" asset -- but this is a bubble that plays a useful social role (it economizes on commodities that have uses other than record-keeping). Prior to Ostroy's work, the answer to the question of how fiat money can possess exchange value was that its value is somehow supported by government decree (the original meaning of the word "fiat"). In particular, the government could introduce paper and insist that taxes be paid in government paper. A recent paper by William Luther and Lawrence White (Positively Valued Fiat Money after the Sovereign Disappears: The Case of Somalia) casts some doubt on the strength of the mechanism highlighted by this older view. One of the most astounding phenomena of the domestic market is the continued circulation of the old Somali bank notes. The Somali currency has had no central bank to back it up since the bank was destroyed and looted in 1991. Nonetheless,the currency has maintained value, and has floated against other foreign currencies that are traded freely in local markets. Perhaps the most convincing evidence that the Somali shilling held a positive value in the absence of sovereign support, however, is that individuals found it profitable to counterfeit these notes. Mohammed Farah Aideed ordered roughly 165 billion Somali shillings in 1996 from the British American Banknote Company based in Ottawa, Canada. Another 60 billion Somali shillings were imported by Mogadishu businessmen in 2001. In total, an estimated 481 billion in unofficial Somali shilling notes have been printed since 1991. This counterfeiting phenomenon, however, does not appear to be excessive; and, indeed, it probably plays some positive role in keeping the supply of shillings relatively stable. A Bad Rap for the Bond Raters? Who's going to listen to a company whose name translates to "average and below average"? Jon Stewart. 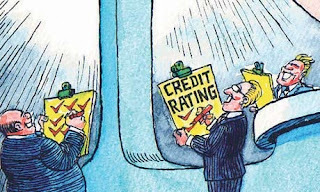 And S&P, along with its sister rating agencies, played a major role in causing that crisis, by giving AAA ratings to mortgage-backed assets that have since turned into toxic waste. The first thing we have to ask, of course, is what does a AAA rating actually mean? The only thing most people know is that AAA is the highest rating that agencies attach to bonds. But that's an ordinal statement; it does not necessarily imply "absolutely free of risk." Apart from death and taxes, there are no perfect guarantees in life. The second thing we have to ask is what sort of risk are the ratings trying to measure. In a nutshell, they measure the risk that the terms of a contract are not fulfilled. They do not measure the liquidity risk associated possession of the asset (the major problem during the financial crisis). Note: by liquidity risk, I mean the ease with with one can dispose of an asset (or use it as collateral in a loan) over a short period of time, without the asset being ridiculously discounted in the market. Now, there seems to be no question that in the depths of the crisis, a lot of MBS was treated as if it were toxic (it was heavily discounted). But as I said above, bond ratings do not (I do not think) measure liquidity risk. They measure things like, well, did the MBS actually deliver on the interest and principal that was expected? It surprising how difficult it is to find out just how much of the outstanding MBS actually did end up as toxic waste. Paul Krugman seems to think it was a lot. So do a lot of other people. But where is the data? Of the notional principal amount of AAA/Aaa subprime bonds issued in the years 2006, 2007 and 2008 (which is almost $2 trillion), the realized principal loss as of Feb 2011 is 17 basis points – almost nothing, but much higher than AAA/Aaa other stuff. Yes, I think the agencies are being treated unfairly by uninformed people. There are many other facts that are similar that are also inconsistent with the popular narrative of the crisis. Evidently, Gary has a PhD student working on this. I look forward to reading her findings (and reporting them here). Of course, if anyone out there has evidence relating to this question, I'd greatly appreciate hearing from you. Thanks to Jesse for this link to Bond Girl, who makes a lot of the same points (and more). I know that agency portfolios were buying wide-window AAAs off subprime, mostly 06-07 vintage. They bought a lot ($250B if I remember correctly). Note: portfolios were the hedge funds that FN/FH were running, outside of their traditional business as mortgage guarantor. Average original subordination was 26-30%. So actual losses on subprime would have to be around this level to start showing losses. Currently, actual losses aren't at this level, but it's easy to see that they will increase (barring a miracle). To date, most subprime deals have taken losses in the 15-20% range (percentage of original balance). They have serious delinquencies 40-60% of current balance (serious dlq defined as 90+ days dlq, FCL, or REO). 15% current losses leave you with 11-15% subordination (on average). Currently, subprime loss severity is around 80% (upon liquidation of the house). For a 50% dlq deal => 50%x80% = 40% additional losses from here (distributed over time). That would imply actual losses of 25-29% on the current face of the class. Average factor for these classes are 0.55. Very roughly, this translates to 12-16% loss on the original investment. For examples, take a look at OOMLT 07-5 1A1(cusip 68403HAA0) and CWL 06-26 1A (cusip 12668HAA8). One of the agencies owns these classes (almost all subprime deals have a Group1 / Group2 structure. Group1 was conforming balance subprime loans that went to the agencies). You can find the remittance reports at BoNY web site or CTS. They are publically available. Rebel Economist (see comments below) directs me to this interesting link: Is Blaming AAA Investors Wallstreet Serving PR?